For several legislative sessions, lawmakers in Columbia have discussed bills to allow doctors to prescribe medical cannabis to SC patients. 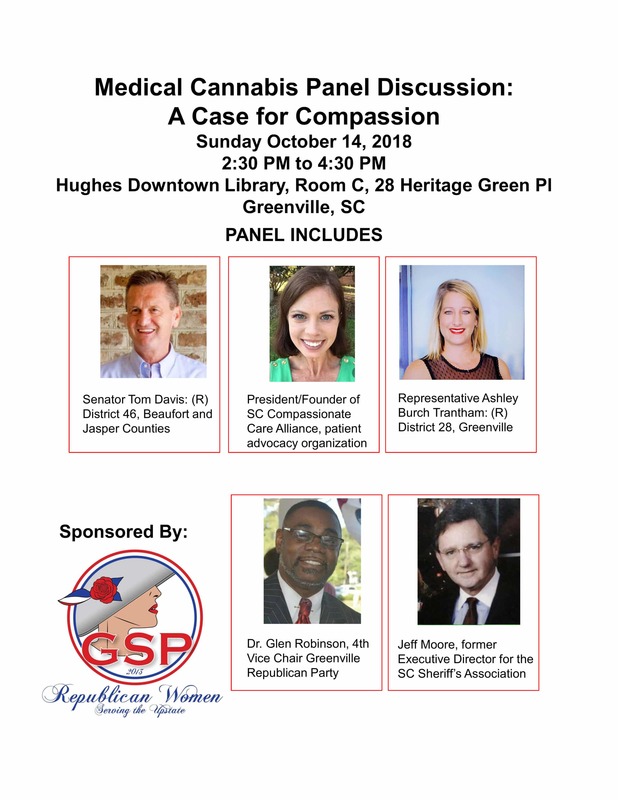 The GSP Republican Women invite you to attend a panel discussion featuring Senator Tom Davis (R), Representative Ashley Burch Trantham (R), Jill Swing, President/Founder of SC Compassionate Care Alliance, Dr. Glen Robinson, 4th Vice Chair Greenville GOP, and Jeff Moore, former Executive Director for the SC Sheriff’s Association. This will be a discussion providing education for the use of cannabis for therapeutic purposes in the state of South Carolina with a focus on answering audience questions. This is a FREE event, with a limit of 100 attendees, so please sign up. On January 10, 2017, Senator Tom Davis (R-Beaufort) and Representative Peter McCoy (R-Charleston) introduced The South Carolina Compassionate Care Act, which would allow qualifying patients with debilitating medical conditions and a recommendation from their physician to use and safely access medical cannabis. The Department of Health and Environmental Control would regulate and license cultivation centers, processing facilities dispensaries and independent testing laboratories. The department will also issue registration cards to qualifying patients and their caregivers. The bill garnered bi-partisan support in both bodies of the state legislature. The bill was passed in both the Senate Medical Affairs Committee and the House Military, Medical and Public and Municipal Affairs Committee, but not in time to be heard on the floor in either chamber. (c) any other serious medical condition or its treatment added by the Medical Cannabis Advisory Board. DHEC will appoint a Commission to help write regulations, award licenses, and administer the program that will be made up of appointees from DHEC, LLR, SLED, the SC Board of Medical Examiners, the SC Sheriff’s Association, SCDA, SC Commission for minority Affairs, and the Governor’s appointees as industry and patient representatives. Recommending physicians must have a bona-fide relationship with their patient and a minimum of 3 hours of continuing education (CME) specific in cannabinoid medicine within one year of writing recommendations. Smoking is not a legal form of administration of medical cannabis. Edible forms of cannabis infused products will be defined by DHEC so as not to appeal to children and will have no more than 10 mgs of THC per serving. All products must be in opaque packaging and clearly labeled as medical cannabis with third party laboratory testing for each batch. Any patient or caregiver intentionally diverting medical cannabis or in any way operating outside the confines of this legislation will have their registration card revoked and is subject to a fine of more than five thousand dollars or imprisonment of not more than five years, or both. Please go to www.scstatehouse.gov and Bill Search 212 for the full text of last session’s South Carolina Compassionate Care Act or for more information on medical cannabis legislation in South Carolina, go to www.sccompassion.com. You may also contact Jill Swing, President of SC Compassionate Care Alliance, at jill@z59.6db.myftpupload.com.